As you watch and screen the documentary your feedback will be key to us expanding the docusphere (from kinesphere) of ‘Five Ways In’ and populating the website with more footage you are interested in. Inspired in part by the visual anthropological work of Jean Rouch we involved the CI community during the whole process of making the documentary from initial conception to final editing. We also organised screenings to audiences not familiar to CI to get a sense of what we needed to include in the documentary to make CI more accessible to a wider audience. We thank all those who participated at the following events, we hope you can see your feedback in the final version of the film. Freiburg Festival 2013, Brixton Hill, London (October 2013) , Rowan and Adam’s House (October 2013), Ibiza Festival 2013, Israel Contact Festival 2013, Mannedorf, Switzerland (December 2013), Earthdance New Year’s Jam (2013), Universiteit van Amsterdam (January 2014), University of Sussex (March 2014), Bern Jam (2014). One of our aims is to include key videos and documentation from our feedback events on this website so you can see how it influenced the edit and our appreciation of the form. 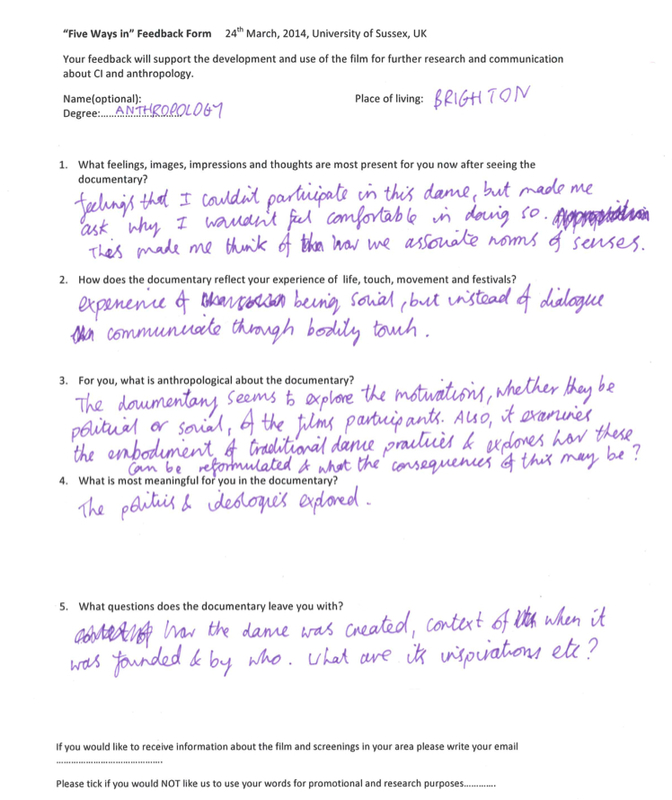 For example here is some feedback from our screening at the University of Sussex in March 2014. The feedback was from a second year anthropology student. This feedback along with other conversations confirmed how the documentary encourages reflexivity but also that we needed to give more context for the history of CI. This contributed to our decision to put introductory titles at the beginning of the documentary and to ensure that Jess Curtis’ interview at the centre of the documentary had sufficient information on this theme. If you are a kickstarter supporter and purchased an advanced copy of the film you will receive a link to download it. We encourage you to screen it with friends and feedback to our website so we can further expand the issues and questions we address. How to organise feedback at a screening? We suggest after screenings you have group discussions around the following questions. It is important that people communicate what the film meant to them personally. We find grounding the discussion in how people have received the film personally is the best starting point for discussions of what the film reveals or doesn’t about CI and the wider political context. What feelings, images, impressions and thoughts are most present for you now after seeing the documentary? 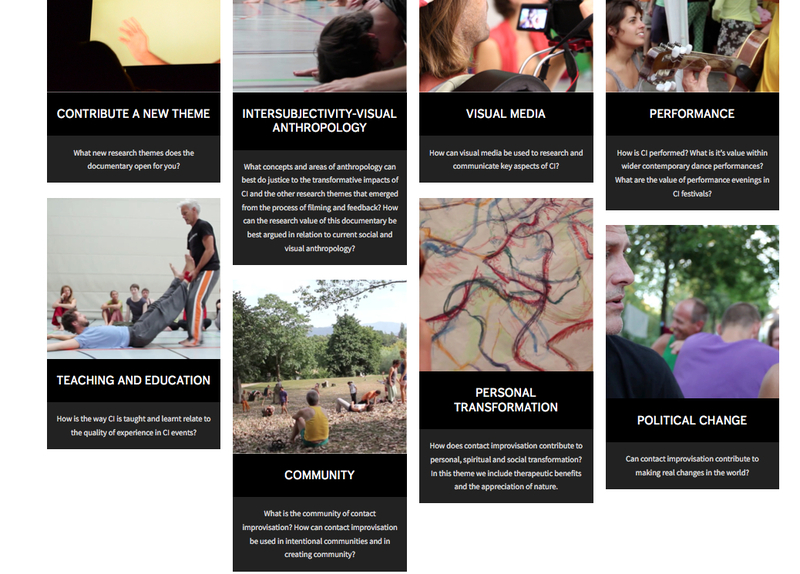 How does the documentary reflect your experience of life, touch, movement and festivals? For you, what is anthropological about the documentary? What is most meaningful for you in the documentary? What questions does the documentary leave you with? How to contribute to the research themes? We then invite you to contribute to the discussions around each theme in the comment section below. You might also suggest some new research themes. You may need to sign up with an account with a free wordpress.com to do so or leave your email. Please Contribute and feedback in the comments section below. If you could identify the research theme in your feedback that would be wonderful. To feedback a screening you have organised please also give some details of where and when and please send us some photographs. Once we see the extent of feedback we may be able to group it separately under the different themes on the website but for the time being we would like it all to be in the same place.